When Bill Weber and Amy Vedder arrived in Rwanda to study mountain gorillas with Dian Fossey, the gorilla population was teetering toward extinction. Poaching was rampant, but it was loss of habitat that most endangered the gorillas. Weber and Vedder realized that the gorillas were doomed unless something was done to save their forest home. Over Fossey's objections, they helped found the Mountain Gorilla Project, which would inform Rwandans about the gorillas and the importance of conservation, while at the same time establishing an ecotourism project -- one of the first anywhere in a rainforest -- to bring desperately needed revenue to Rwanda. 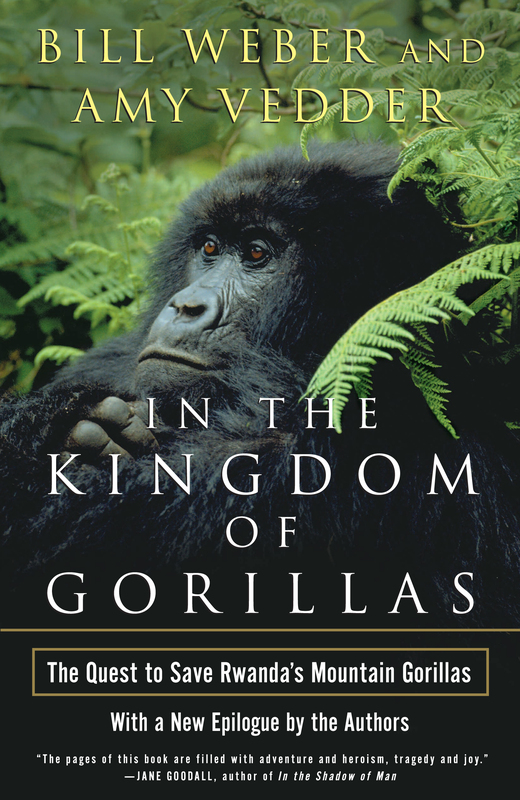 In the Kingdom of Gorillas introduces readers to entire families of gorillas, from powerful silverback patriarchs to helpless newborn infants. Weber and Vedder take us with them as they slog through the rain-soaked mountain forests, observing the gorillas at rest and at play. Today the population of mountain gorillas is the highest it has been since the 1960s, and there is new hope for the species' fragile future even as the people of Rwanda strive to overcome ethnic and political differences. Go ahead. Sit next to him. Adrien deSchryver's suggestion was part tease, part dare. Amy hesitated, then smiled as she began to crawl toward Casimir, a massive silverback scowling at us from beneath a tree about thirty feet away. Surprised by her eager response, deSchryver grabbed Amy by the belt and pulled her back to his side. For the next thirty minutes, we watched Casimir and his family of gorillas from a respectful distance of fifteen to twenty yards. Thick bamboo limited our views to isolated body parts. The gorillas tolerated our presence, but several stayed completely out of sight and all were clearly nervous. Occasional screams ripped the still mountain air. Powerful smells and strange plants enhanced the sensory stew. We were elated. Our pygmy guide, Patrice, was calm -- seemingly bored -- throughout our time with the gorillas. But on our hike back to park headquarters he grew more animated when another creature caught his eye. Patrice stalked his tiny prey until it led to an invisible target. Locating the entryway to the bee's nest, he ignored repeated stings as he ripped open the rich ground. Within a minute, he returned to our group with a wide grin on his face and large chunks of dripping honeycomb in his hands. DeSchryver grabbed some moss from a tree and showed us how to soak up the abundant honey like a sponge; Patrice preferred to eat the comb, larvae and all. Soon our faces were smeared with an indescribably exotic mix of flavors and substances. On that late summer day in 1973, we entered the land of gorillas and honey. Five years later, we would experience the wonder of sitting peacefully among mountain gorillas in Rwanda -- and the awesome responsibility of trying to save their population from extinction at the hands of humans. But in 1973 we were Peace Corps volunteers in eastern Congo, with much more to learn before we could make any meaningful contribution to conservation. We met in 1969 at Swarthmore College and married three years later. Two kids from small towns in upstate New York, we shared the best and worst of the late 1960s and early 1970s. The King and Kennedy assassinations, Vietnam, Kent State, acid rock, Earth Day, Women's Lib, the Generation Gap, and seemingly endless cultural conflict. Through much of that turbulent time, Swarthmore's Quaker tradition was a calming influence. While other campuses went up in flames, our passions were doused with a smothering blanket of Quaker understanding -- and the admonition to use our learning and experience to go forth and make the world a better place. Following graduation, our budding interest in conservation and an urge for adventure led us to Africa via the Peace Corps. We weren't qualified for specialist positions in parks or wildlife management, so we joined more than one hundred other volunteers to be trained as the first teachers sent to Congo, which was then known as Zaire. Our arrival in Africa was more eventful than expected. En route from London to begin our Peace Corps training in eastern Congo, we were scheduled to land in the Rwandan capital of Kigali and change planes for a short hop over the border to Bukavu. An overnight coup in Rwanda had closed the airport, however, and we were forced to make an unannounced landing at Uganda's Entebbe airport. This was not a reassuring prospect at a time when Field Marshal, General, and Dictator-for-Life Idi Amin Dada was ruling the former "Black Pearl of Africa" with an increasingly erratic and ruthless hand. Worse, Amin himself was due at the airport at any moment to welcome President Bongo of Gabon. After quickly refueling, we took off and headed west toward Congo. As Lake Victoria shimmered below in the early morning sun, our mood relaxed -- until the pilot announced that we had been told to return to the airport. We later learned that Amin had seen our plane lift off and scrambled two MiGs to reinforce the order to return. Back on the ground, we watched as our suitcases, trunks, backpacks, and guitars were thrown from the cargo hold onto the runway. Ugandan security agents then collected our passports and ordered us to join our belongings on the hot pavement below. There, we were surrounded by at least twenty khaki-clad soldiers bearing AK-47s and persistent scowls. Parental premonitions about the foolhardiness of our African adventure began to seem all too real. After two hours of exposure to the equatorial sun, we were ordered inside the small bunkerlike building that passed for Uganda's international airport. Within three years, its layout would be printed on the front page of every major newspaper in the aftermath of the Israelis' "Raid on Entebbe" to rescue a planeload of their own citizens seized by terrorists. Our experience was far less dramatic. We spent more than fifty hours of tension-filled boredom, talking among ourselves, nibbling at a suspect mix of green beans, green French fries, and green meat of unknown origin, while drinking rationed supplies of warm Bell lager beer. Ugandan airport workers cast furtive glances our way and rarely spoke. The few who dared to break the silence asked us not to judge their country by this incident. Our curious captivity included the right to watch the Ugandan national news on the airport bar TV each evening. There we learned that we were "mercenaries bound to destabilize Rwanda." This was a strange charge to pin on a group of 112 young Americans, two-thirds of whom were women. To document the threat, Amin appeared in person early on the second morning to take a picture of our increasingly ragtag band with an Instamatic camera that looked ridiculously small in his beefy hands. It fell to President Mobutu Sese Seko of Congo to convince Amin that he was holding nothing more than a group of volunteer schoolteachers. Early on our third day, we were released and flown to the Congolese capital, Kinshasa. Meanwhile, the July 5 coup in Rwanda proved to be bloodless, with no outside interference and apparently little internal resistance. Diplomats would later describe the event as a peaceful transition of power from a stagnant clique of southern Rwandan Hutu to their more dynamic cousins from the northern volcanoes region. We paid little attention to such details at the time. We would learn much more about the regional politics of Rwanda in the years to come. By some stroke of fate, we were assigned to teach at a small school along the shores of Lake Kivu, partway between the town of Bukavu, where we had received our Peace Corps training, and the Kahuzi-Biega National Park, where we had first seen wild gorillas. We shared a house in Bukavu with another volunteer named Craig Sholley. Sitting on our front porch most afternoons, we watched dramatic storms sweep across the vast expanse of Lake Kivu, its picturesque islands framed by imposing mountains on all sides. The pulsing red glow of the Nyiragongo volcano dominated the evening sky, about seventy-five miles to the north. To the east, the Congo-Nile Divide rose to ten thousand feet to form the rugged backbone of Rwanda. The border with Rwanda was ten minutes from our house, but in the immediate wake of the coup it was rarely open. Congolese and Rwandan residents crossed back and forth between the border towns of Bukavu and Cyangugu, but foreigners were generally not welcome. When Rwanda did open its doors, visitors were required to be clean-shaven, short-haired, and well dressed. We joked that this would assure that no one but CIA agents could enter. Rumors held that ancient tribal animosities and other dark secrets were shielded by the closed border and Rwanda's perpetual cloud cover. Most young travelers who reached Bukavu while wandering across Africa were left to imagine Rwanda's attractions -- including the exotic Nyungwe Forest, where an especially potent form of marijuana was cultivated by the mountain forest dwellers for whom Pygmy Thunder was named. Far to the north, a reclusive American woman was said to live alone among the mountain gorillas that made their home in the Virunga volcanoes. In 1974, we received our only firsthand look at the country during a short transit drive through Rwanda to neighboring Burundi, in the company of an American diplomat. Compared to Congo, it seemed a much less developed country, a simple society where earthen huts with thatched roofs dotted an overwhelmingly agrarian landscape. On that Sunday, though, Rwanda's dirt roads were filled with people: drab men in secondhand Western suits, accompanied by women in flowing robes of dazzling colors. We wondered if they were Hutu or Tutsi. Adrien deSchryver was chief warden of the Kahuzi-Biega park. Six years earlier, when Congo's bloody civil war raged around Bukavu, deSchryver was a one-man force for law and order within the park. Poachers had already killed his brother and narrowly missed Adrien himself. Born in Congo (when it was a Belgian colony), with a Congolese wife and family, he was single-mindedly committed to the park and its gorillas. These were eastern lowland gorillas, or Grauer's gorillas as they were sometimes known from their scientific name Gorilla gorilla graueri. They were one of three recognized subspecies of gorilla. The lowland gorillas of west-central Africa were much more numerous, whereas the mountain gorillas on the other side of Lake Kivu were considered the most endangered of the three. But no one really knew how many eastern lowland gorillas existed in the Kahuzi-Biega park, let alone across their range in the surrounding Kivu highlands. DeSchryver wanted a census of the gorillas. He also wanted assistance with his effort to habituate Casimir's group and other gorillas for tourism viewing, which he felt was the only way to save the park from intensive poaching. We had discussed our interest in conservation during earlier visits, but were pleasantly shocked when he asked if we would help with the census and tourism. We jumped at the chance. The Peace Corps was supportive, too, agreeing to fund our positions in Kahuzi-Biega as long as we finished our original two-year commitment as teachers. During the summer break between school years, we traveled overland by truck, boat, train, and bus to Tanzania and Kenya. There we saw the incomparable wildlife spectacles of the East African plains. We traveled and camped in ten different parks in habitats ranging from mountains to deserts and savanna grasslands to coral reefs. Our commitment to the cause of conservation grew even stronger. Yet our East African experience also reinforced our perceptions from Congo that local Africans gained little from tourism, while absorbing almost all of the direct costs of conservation. They were prohibited from hunting and other forms of traditional use on lands declared as parks, yet most conservation-related jobs went to people from outside the local area. Park revenues flowed straight into central government coffers. We wondered how Africa's vast biological wealth could survive in the face of overwhelming human poverty and growing pressures for economic development. It was a haunting concern. Like any important challenge, it was also an opportunity. We had originally thought that only Amy, with her degree in biology, could do serious conservation science. Faced with pressing questions of local perceptions and the true costs and benefits of conservation, Bill saw how his social science background was equally relevant. All that was left was to convince others that a multidisciplinary approach to conservation -- one that considered the needs of both people and wildlife -- was worthy of support. Such an approach was certainly needed around Kahuzi-Biega, and we felt that it would be of value everywhere we had been during our African travels. In mid-1975, we returned to the United States to secure an affiliation with an appropriate graduate school. We chose the University of Wisconsin because of its strong tradition in conservation that stretched back to John Muir and Aldo Leopold, and its excellent field biology program, which had produced the world's foremost gorilla expert at that time, George Schaller. Wisconsin also had initiated a radical new program that offered an interdisciplinary Ph.D. in applied conservation science, perfect for Bill's interests. We intended to take a few courses in our respective programs, absorb as much as we could from faculty and fellow students, and return to Congo after one semester. Complications arose between the Peace Corps and the Congolese park service, though, and our return was delayed. Fortunately, a fellow grad student named Tag Demment had discussed our background and interests with Richard Wrangham, a rising star at that time in the field of primatology. Richard had just returned from a short stay at the Karisoke Research Center in Rwanda, where Dian Fossey was studying endangered mountain gorillas. Richard called to tell us that our applied work on gorillas and the problems confronting them would be of great value if carried out in Rwanda. That there was a need didn't surprise us. But his contention that Dian Fossey would welcome our work didn't fit with what we had heard about the strange recluse of Rwanda. Richard acknowledged her "eccentricities" -- an extreme understatement, we would learn, even by his British standards -- but reiterated the need. When Wrangham secured a written statement of interest from Fossey, we modified our proposal to fit Rwandan circumstances and sought financial support. In 1977, there were only two U.S.-based conservation groups with significant international programs: the World Wildlife Fund and the Wildlife Conservation Society (then known as the New York Zoological Society). At the time, WWF was considered to have a more applied focus and we approached them first. In a private meeting in Madison, however, a senior WWF official regretfully told us that he had discussed the gorillas' plight with Fossey and concluded that "the situation was hopeless." This was a serious blow to our funding prospects, but also a spur to get to Rwanda before it truly was too late to help the gorillas. We were not confident that our proposal to the Wildlife Conservation Society would be well received. WCS was certainly interested in gorillas: they had funded George Schaller's pioneering study almost twenty years earlier and had given some initial support to Fossey in the late 1960s. Part of our research would appeal to them, with its biological focus on feeding ecology, habitat use, and population dynamics: all essential factors in the mountain gorilla's survival equation. The "people" side of that equation was another matter, however. While we were convinced that social and economic factors were just as important as those in the biological realm, this was not a widely held belief in the world of conservation in the 1970s. Fortunately, WCS proved itself not bound by tradition, nor daunted by the task at hand. In September 1977, we received our full request of $11,850 for an eighteen-month project. All we needed was final clearance from Fossey and the Rwandans. In October, we met Dian Fossey for the first time, at a hotel restaurant in Chicago. We were joined by another prospective researcher named David Watts. It was an awkward dinner, as Dian made small talk and watched the three of us eat while barely touching her own main course of grilled fish. She did, however, unwrap and consume at least a dozen pats of butter during the meal. She also dumped the entire bowl of sugar cubes into her handbag on leaving the table. Back in her room, Dian stretched out her six-foot-two frame on her bed, put on her reading glasses, and began to read our proposal out loud. She stopped occasionally to comment on minor points but raised no substantive concerns -- except to note in passing that ecology was boring and that work with local people was hopeless. At the end of the evening, we set a tentative arrival date and asked if there was anything else we needed to do, such as requesting authorization for our work from the Rwandan park service. Dian said she would take care of everything. "The authors convey a clear and vivid affection for their research subjects and an abiding fascination with their behavior...entertaining reading." "As a primer for the uncomfortable reality that lies ahead, every starry-eyed would-be conservationist should read this book...Its range is immense."